Party Fowl, rather new to the Nashville hot chicken scene, has what is probably the most elaborate cocktail in all of Nashville. 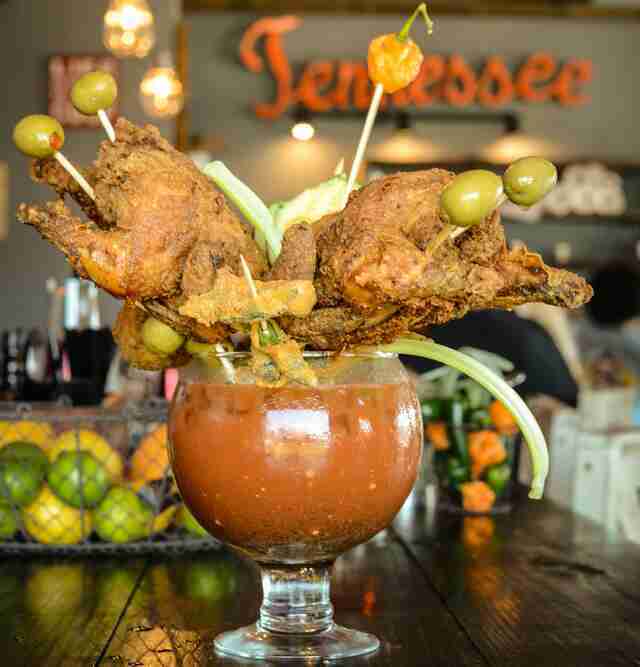 In fact, it’s not just a cocktail; this Bloody Mary is actually listed on the menu as “Brunch for Two.” It’s a 51oz Bloody Mary that’s topped with two pieces of fried chicken on sticks, avocado, fried okra, and of course, celery and olives. It’s literally a brunch fit for two. So, if you’re looking for an entire fried chicken meal to eat alongside your Bloody Mary cocktail, Party Fowl is your spot. Just don’t forget to take a friend. 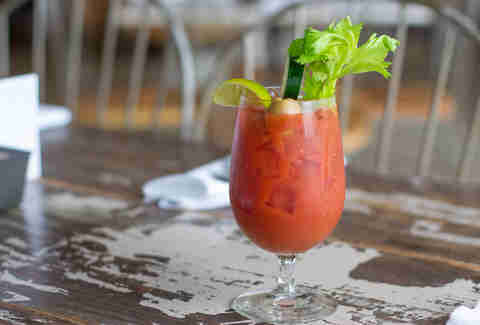 You’ll feel like a true Southerner sitting in Husk eating brunch and sipping on one of the Bloody Marys. 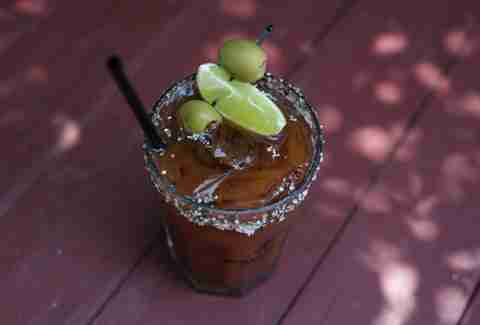 Husk’s Bloody Mary is rumored to have upwards of 30 different ingredients in the recipe that are kept top secret. It looks average enough, but this version is one of the smoothest and most delicious cocktails in Nashville. Seriously. And seeing as it is truly one of the best Bloody Marys in town, we’re fine with this place hiding the recipe so long as it just keeps on serving them. This bar has a great tavern-like vibe that’s perfect for a relaxing visit with friends, complete with cocktails in hand. 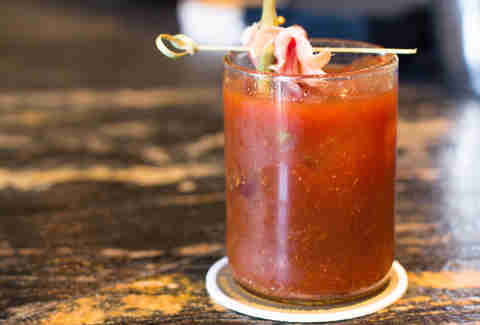 And despite its namesake, Whiskey Kitchen also makes one hell of a Bloody Mary. Its simple version, known as the Stoli "Wicked" Bloody Mary, is made with house-infused “wicked” pepper and olive-infused vodka. We highly recommend pairing your tomato cocktail with some of the famous fried green tomatoes. This restaurant has become a popular meeting spot that offers a coffee shop, bowling alley, private event space, and outdoor pools and bocce ball during the summer. Pinewood Social prides itself in being an all-around great spot to socialize and we don’t disagree. It also just so happens to have a great brunch menu complete with both a classic Bloody Mary AND a Bloody Maria (tequila instead of vodka). 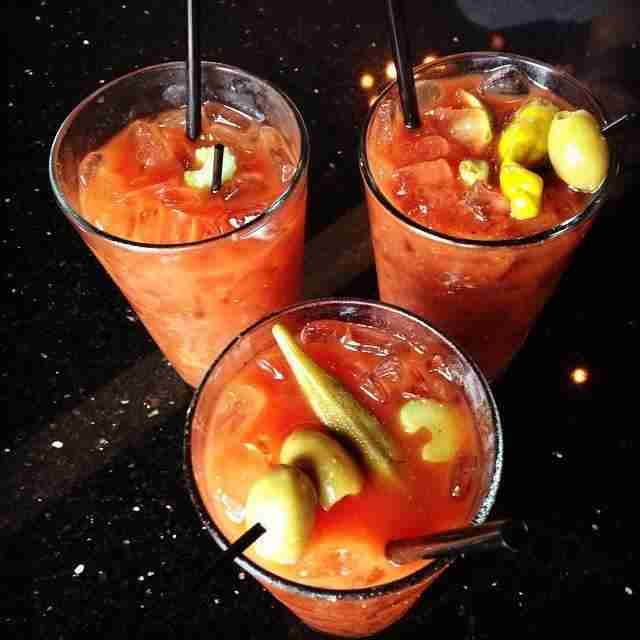 While the brunch menu is only served on the weekends, you can get a Mary or Maria any day of the week. This Mexican-inspired cantina serves both Bloody Marys and Bloody Marias as part of its weekend-only brunch menu that, if you haven’t already, you’re going to want to partake in ASAP. 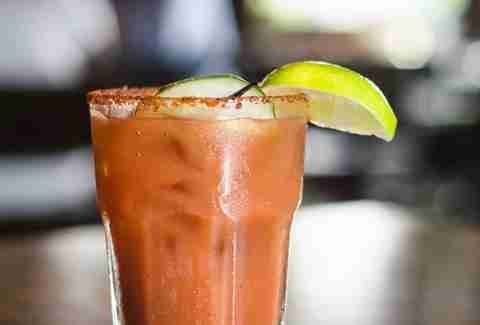 The Bloody Maria is one of its signature brunch libations that is basically a classic Bloody Mary that’s made with tequila instead of vodka with a nice rim of salt around the glass. 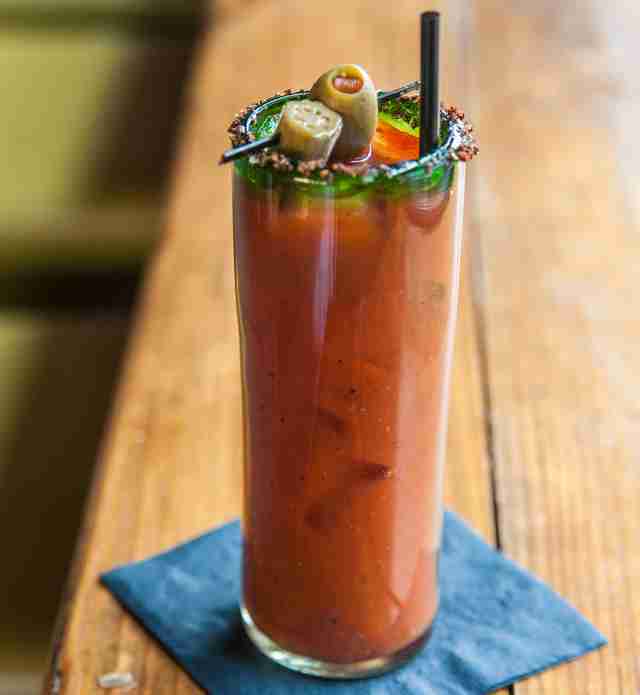 Your Bloody Maria would be well paired with one of the delicious breakfast burritos. Marché is a bright and cozy cafe with a warm European vibe and, not surprisingly, a great Bloody Mary. Its take on this cocktail includes cucumber-infused sake and a spicy house-made Bloody Mary mix. Marché is an especially popular weekend brunch spot (and for very good reason) so you might want to consider going early since reservations are not accepted for brunch. The Flipside, a casual burger joint in 12South, has a nice retro diner vibe with an emphasis on '50s decor. 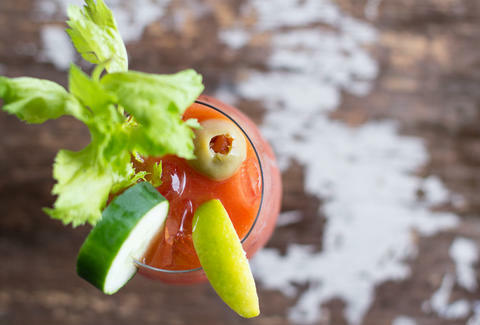 The brunch menu happens to be one of our new favorites in Nashville and comes with two different Bloody Mary options: the “Fix” and the “Big Fix.” You can order a classic Bloody Mary (the Fix) which during brunch hours are two for the price of one. 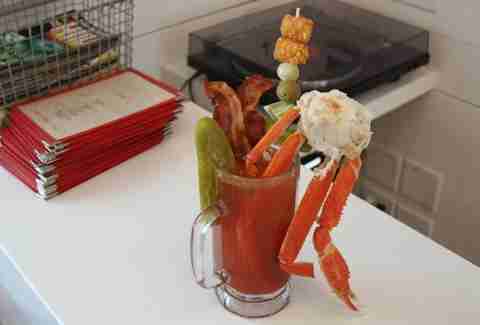 However, you can also opt for the slightly more elaborate Big Fix, which is served in a large frosty mug with a pickle on the side, full strips of bacon sticking out of the top of the glass, a stick filled with chicken and tots, AND a big ole’ snow crab claw. There’s really no question which one we’re going to order. 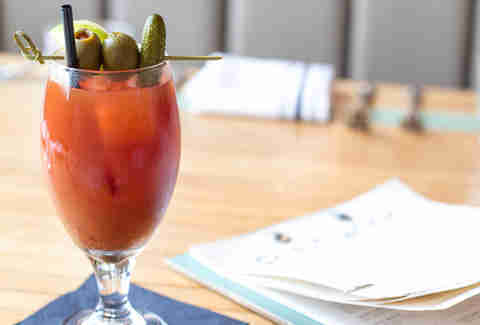 This Nashville staple restaurant is known as the “pub for chefs” and prides itself on being “a local foodie favorite.” The Bloody Mary options include a classic Bloody Mary, known as the Wicked Bloody Mary, as well as a cucumber-infused Bloody Mary, called the Cucumber Mary. 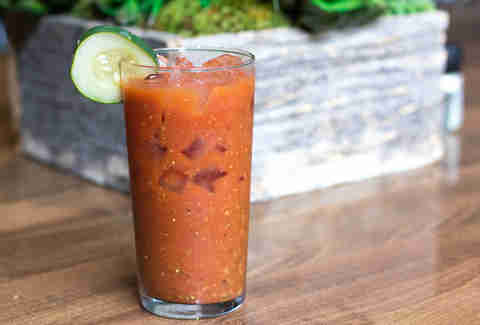 The Cucumber Mary is made with the resto's spicy Bloody Mary mix and house-made cucumber-infused vodka. This hip biscuit joint has really made a name for itself recently and our guess is that it’s not just all about the biscuits. Biscuit Love Brunch also has one hell of a Bloody Mary (known at the restaurant as “The Bloody”). The garnish is simple but the spicy kick is a powerful one. And if you want an all-around spicy Southern meal, order “The Princess” (hot chicken biscuit) to go with your cocktail. 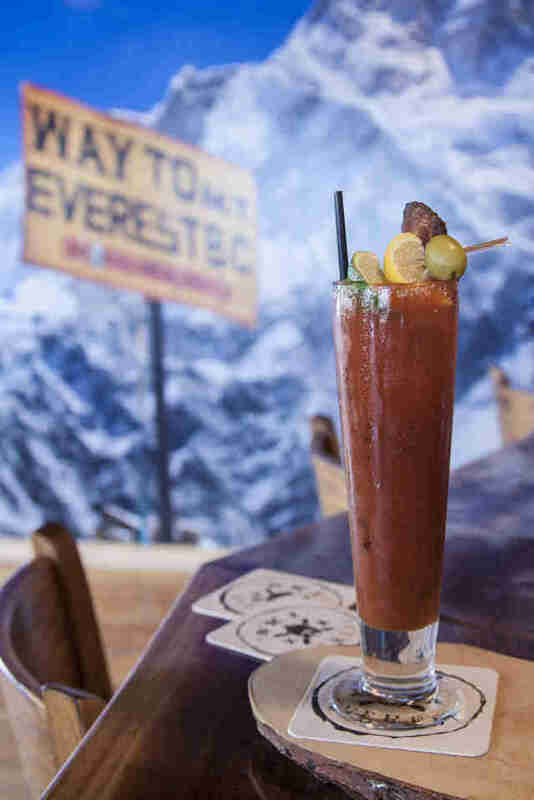 Embers Ski Lodge is the hip new slopes-inspired restaurant and bar in 12South that’s designed to “create the warmth and camaraderie of a ski lodge.” Its Bloody Mary is served only on the weekends during brunch hours and is known as the "Every Day I’m Trufflin’." This cocktail is made with truffle-infused vodka (yum! ), smoked paprika, and truffle salt with a piece of crispy Broadbent bacon served right in the glass. So, even if you can’t make it to the slopes this winter, you can always enjoy a big brunch at Embers Ski Lodge, and enjoy this Bloody Mary by the fire. If you ask a local where to go for a good Bloody Mary, chances are high that they’ll direct you to Mad Donna’s. Largely loved for its drag queen bingo nights and perpetual drink specials, this unique bar is truly an East Nashville favorite. It serves Bloody Marys, know as “Mad Marys” on a daily basis. However, on the weekends it has a special (and very popular) weekend brunch fully equipped with a build-your-own Bloody Mary bar. Brita Britnell is a Nashville writer & photographer who strongly believes in the importance of Worcestershire sauce. Disagree with her on Twitter at @BBritnell.